In this episode, we continue our intensive practice with irregular verbs. The verbs are in different groups, which makes it easier to memorize and learn them well. First, there is a listen and repeat section followed by an exercise where the learner hears short sentences in the present and puts them in the simple past tense. The script of this episode is offered free of charge in the PDF file and is also found below directly on this page. P.S. 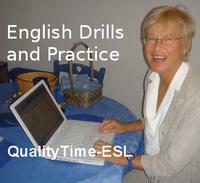 If you are interested in my philosophy of teaching and wish to get a lot of valuable exercises, have a look at QualityTime-ESL: The Digital Resource Book available in our store.